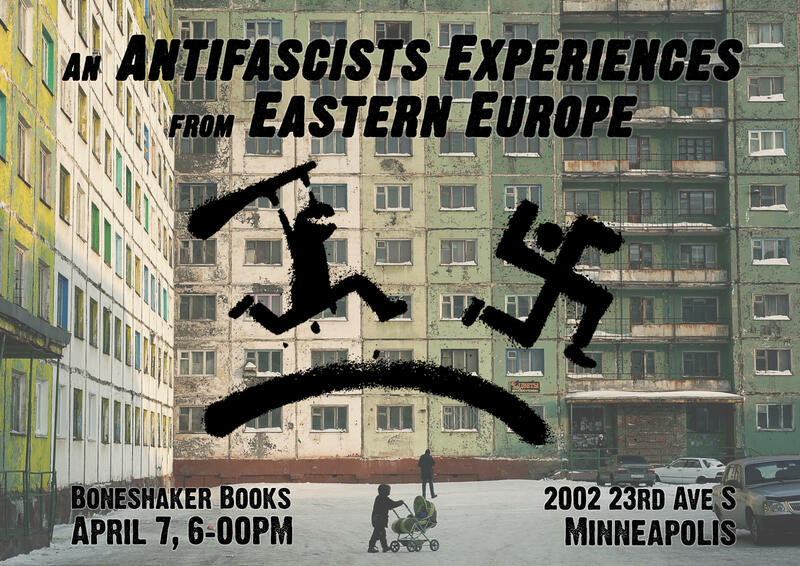 Event: An Anti-Fascist’s experiences from eastern Europe. Saturday, April 7th, 06:00pm Boneshaker Books, 2002 23rd Ave S in Minneapolis. Originally published by Conflict MN. In the last few years we have seen the far right taking more public space, in the news and in the streets of the U.S. Obviously there is a need to organize against it and increasingly people are seeing anti-fascism as a way to do that. To make our organizing more effective we should take into account experiences from other contexts. This presentation will be a critical introduction to the history of anti-fascism mostly in Russia but also Belarus and Ukraine spanning the last few decades. The talk will ask some critical questions and reflect on comrades’ experiences in Eastern Europe. What tactics, strategies, and organizing have been most useful? How do anti-fascist actions influence the anarchist movement, and does this collision with fascists change our collectives? How can we avoid ‘antifa’ becoming just another youth subculture and not a broader political movement? In Russia, how was it possible that anti-fascism became an essential part of state ideology, with clear conservative connotations? What actually is anti-fascism, and how can anarchists relate to such an ambiguous concept? Questions will be raised and discussion moderated by a visiting anarchist comrade from Russia.